Yesterday was beach day and what a more than perfect day it was. 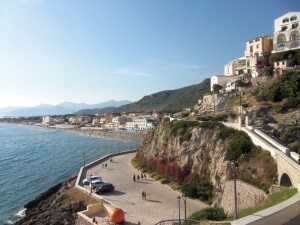 We left after ten in the morning for the little over an hour drive to the beach city of Sperlonga. 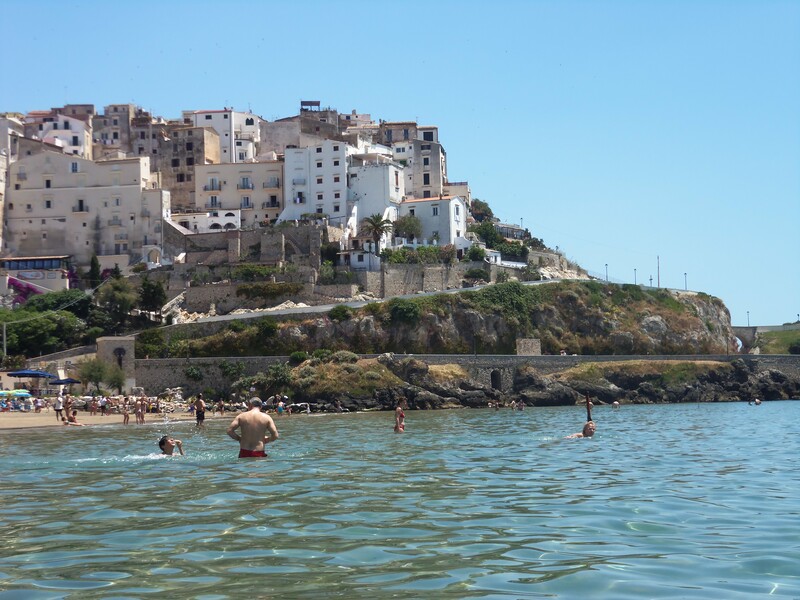 Sperlonga is located about halfway between Rome and Naples, so it is not drowning in tourists and resorts. But it does have substantial amenities for the prospective out-of-town beach-goer. Upon arrival I was nearly floored by the beauty. 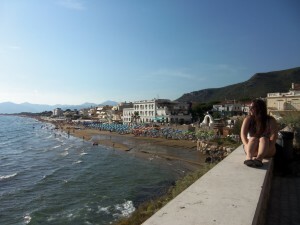 Where was I and how blessed was I to be here? Amidst the curving shoreline (litorale) filled with umbrellas and cabananas, stretched into a high cliff and perched on top was a quaint off-white stone painted town. Shutters were drawn open, laundry hung from balconies, and the sun warmed everything it touched. I thought these places only existed in Disney movies and Buzzfeed Top 13 Places to See Before You Die lists. But no, behold, my feet were firmly planted (or sinking) into the sand. My eyes marveled at this natural and man-made vista. I told my company that this was surely a dream (sogno). They shrugged and remarked it was alright. Alright?! Well this ‘alright’ is perfect for me. My company also agreed on that the water was cold. They dipped their toes in, wrapped their hands around their folded arms and retreated back to our setup. When I tested out the water with my toe I turned to look at them as if they were crazy. The water was the temperature of bath-water. But I suppose that is after a life-long rendezvous with the frigid and dark New York Atlantic Ocean anything 10 degrees warmer would surely feel like a different world. How could I ever see the beaches at my home as beautiful? The water was divinely clear. I waded all the way to my waist and could still see my feet as if I was looking at them in the shower. There was no seaweed to send shivers down my spine when it brushed on the back of my leg, no shells to cut into the bottoms of my feet, and the only rocks were big boulders clustered together in one section. Little tiger-striped fish swam by my toes, and if I neared the rocks I could see little crabs (granchi) scuttling around them. The waves were gentle and the sky was clear. I spent long periods of time in the water after laying out in the sun. One of my favorite parts of the day was just going for a swim by myself. I am a little scared of swimming in ocean water by myself, but I did it anyway. It was wonderful to dive (tuffarsi) under the surface, the immersion made me feel as if I was a part of the ocean. After a few hours at the beach we ventured up to a little look-out point. It gave us a great view of the beach, the city, and the serenity of this little world. It’s difficult to put into words the feeling I got when looking out into the vastness. I suppose sometimes we don’t have words to describe what we see and what we feel because it’s just meant for us. And I will cherish my little moment of paradise standing at the tip of the cliff for as long as I live. Now enjoy a few pictures so I can really punch you in the face with jealousy. Some of the view from the cliff. Here I am looking pensively out into the void. 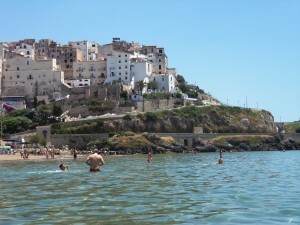 I waded to my waist with my camera to take this picture of the town perched on the cliff. Next PostNext Shop Shop Shop!